Dramatically increase the linguistic capabilities of your device with an MMC card! This removable card stores the full contents of the bi-directional English to/from Arabic, Bulgarian, Chinese, Czech, Farsi, French, German, Hebrew, Hungarian, Italian, Polish, Portuguese, Russian, Spanish, and Ukrainian talking dictionary and phrasebook and can be used with 800 series ECTACO Partner Dictionary and PhraseBook. The MMC card is compatible with your device if it is on the list of available accessories for your device. This fantastic card instantly boosts your handheld`s functionality and versatility and can act as its primary or secondary component. Transfer data quickly and easily between your PC and device with this dedicated USB cable. 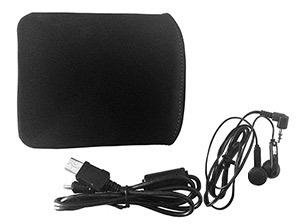 Specially designed to complement your 400/600 series device, this pack includes a PC-link Cable to let your device communicate with your computer, an AC adapter, and a foreign travel kit that allows you to plug in your device no matter where you are. Dramatically increase the linguistic capabilities of your device with an MMC card! This removable card stores the full contents of the bi-directional German <–> Czech talking dictionary and phrasebook and can be used with 800 series ECTACO Partner Dictionary and PhraseBook. The MMC card is compatible with your device if it is on the list of available accessories for your device. This fantastic card instantly boosts your handheld`s functionality and versatility and can act as its primary or secondary component. Dramatically increase the linguistic capabilities of your device with an MMC card! This removable card stores the full contents of the bi-directional German <–> French talking dictionary and phrasebook and can be used with 800 series ECTACO Partner Dictionary and PhraseBook. The MMC card is compatible with your device if it is on the list of available accessories for your device. This fantastic card instantly boosts your handheld`s functionality and versatility and can act as its primary or secondary component. Dramatically increase the linguistic capabilities of your device with an MMC card! This removable card stores the full contents of the bi-directional German <–> Hungarian talking dictionary and phrasebook and can be used with 800 series ECTACO Partner Dictionary and PhraseBook. The MMC card is compatible with your device if it is on the list of available accessories for your device. This fantastic card instantly boosts your handheld`s functionality and versatility and can act as its primary or secondary component. Dramatically increase the linguistic capabilities of your device with an MMC card! This removable card stores the full contents of the bi-directional German <–> Italian talking dictionary and phrasebook and can be used with 800 series ECTACO Partner Dictionary and PhraseBook. The MMC card is compatible with your device if it is on the list of available accessories for your device. This fantastic card instantly boosts your handheld`s functionality and versatility and can act as its primary or secondary component. Dramatically increase the linguistic capabilities of your device with an MMC card! This removable card stores the full contents of the bi-directional German <–> Polish talking dictionary and phrasebook and can be used with 800 series ECTACO Partner Dictionary and PhraseBook. The MMC card is compatible with your device if it is on the list of available accessories for your device. This fantastic card instantly boosts your handheld`s functionality and versatility and can act as its primary or secondary component. Dramatically increase the linguistic capabilities of your device with an MMC card! This removable card stores the full contents of the ECTACO Partner DR800 talking dictionary and phrasebook and can be used with 800 series ECTACO Partner Dictionary and PhraseBook. The MMC card is compatible with your device if it is on the list of available accessories for your device. This fantastic card instantly boosts your handheld´s functionality and versatility and can act as its primary or secondary component. Dramatically increase the linguistic capabilities of your device with an MMC card! 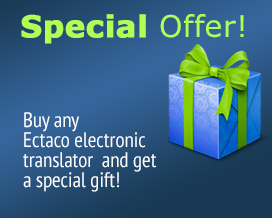 This removable card stores the full contents of the bi-directional German <–> Spanish talking dictionary and phrasebook and can be used with 800 series ECTACO Partner Dictionary and PhraseBook. The MMC card is compatible with your device if it is on the list of available accessories for your device. This fantastic card instantly boosts your handheld`s functionality and versatility and can act as its primary or secondary component.